Secret Server password management software enables IT Admins to export passwords and other Secrets to a plain text CSV file for printing. If you’re in the finance industry you may be required to print certain sensitive information and ship it to a remote location to be stored securely in a bank vault. This is a compliance requirement for many of our customers in finance. The export will only include Secrets that the user performing the export has permission to view. Secret Server has many other easy-to-use features designed to help companies meet the compliance requirements of their industry, like NIST-800-53, PCI DSS and SOX. You can try Secret Server for FREE using the form on the right – it install fast and comes with full support. The ability to export Secrets is guarded by the Administer Export permission using the Role Based Access Control (RBAC). 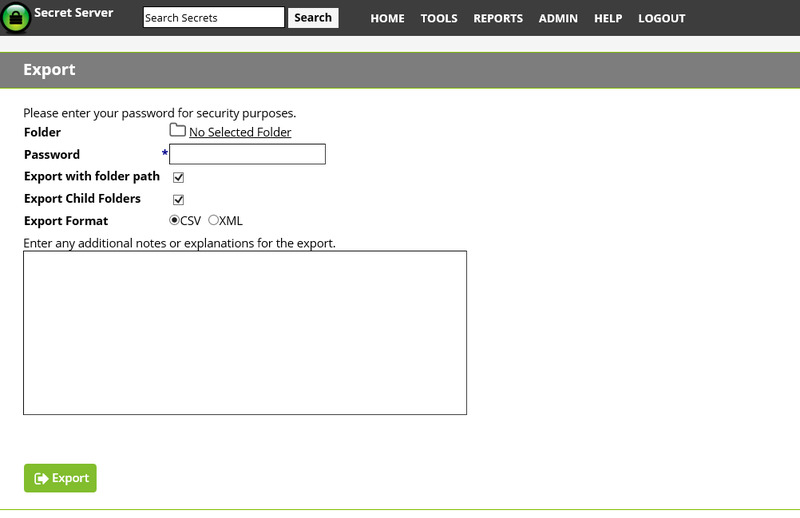 The Administer Export has a great security feature that requires the user to re-enter their password and thus prevents anyone from exporting Secrets when an administrator leaves Secret Server open in the browser. In addition, all export activity is audited with the time, date, user, and IP address.